There is a growing movement towards using Greenland paddles for touring because of the excellent ergonomics and their connection to the ancient past of kayaking. This course will show you how to use these ingeniously simple paddles to their maximum efficiency! This is one of our rare off-water courses. Whether you are handy in the workshop or not, you can build your own Greenland paddle! We provide the raw materials, the workshop with tools, along with the skilled guidance and encouragement of our experienced paddle-maker! You provide the labour and the inspiration to create your own paddling masterpiece. 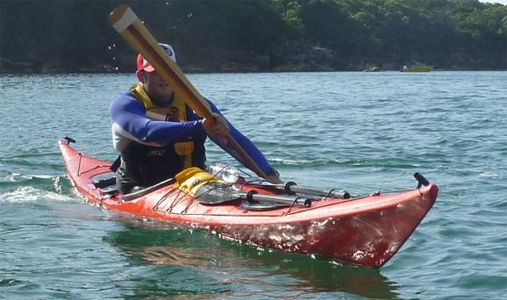 This 90-minute clinic is a great opportunity to learn to roll your kayak, or to improve whatever parts of the roll you have. We teach the Standard Greenland Roll which has proven to be the easiest way to roll your kayak up. The low participant:instructor ratio ensures every participant receives quality individual attention. This is not a beginner course. Participants should be able to do a Standard Greenland Roll already. Here we will work our way through the movements for some of the other simple Greenland rolls. You do not require a Greenland-style paddle or kayak to participate.